Winters frigid cold and snow reluctantly took the day off. From the south evidence of its next assault drapes lazily from the mountain tops like a dark veil. For the moment sunshine lends a sense of false comfort to the afternoon. 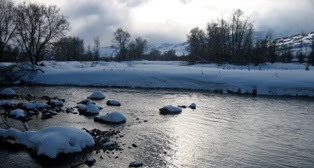 Even with snowshoes travel along the river was relatively cumbersome. A short distance from the parking lot the last struggles of a determined angler are soon behind us. The deep depressions left in the snow gave good reason for their going no further. Traveling among the shadows of the corridors bare cottonwoods any comfort from the sun quickly dissipates. Other than those early remnants of struggling anglers, the rivers cold clear currents are void of two legged’s; a rarity over this past decade even this time of year. Encountering the occasional sign of deer and possibly moose, it’s evident they too struggle. Their bellies drag through the powdered surface where snow is deepest. Winters harsh qualities show no regard for such creatures labored efforts, which for many unceremoniously end in death. The river winds through the valleys bottom black in contrast to the enveloping blanket of snow. Ancient cottonwoods stand as bare sentries over its meandering course. In the distance a lone eagle sits perched enjoying winter’s temporary reprieve before nightfall’s cold and approaching storm assaults all things living left exposed. It’s a tranquil and somewhat foreign scene compared to recent winters past. Pausing at the head of a run, several minute rings form as some of the rivers lesser occupants dine leisurely on those few drifting dipterids left vulnerable. Judging the current and drift, all defined by waters hidden structure, mental stock is taken as if to fish. Being without rod or reel the process is imaginary, yet natural for most that pursue this game when presented with water regardless of the opportunity. Scanning the run before departing, a dissimilar rise catches the periphery of my eye. The tell tale sign of a larger fish still remains, yet rhythmically disperses as I stare. Several minutes pass before the brown takes another hapless midge confirming the illusionary will of false hope. Its broad shoulders break the dark meniscus briefly lending a porthole to its size. For a time all senses are magically consumed. The brown never rose again, yet its image remained transfixed. Prior to leaving mental notes marked the run and trout’s location in preparation for a next visit. Unlike this leisurely day there will be more purpose upon my return. Given this temptation, that won’t be long. Good to hear your adventuresome enough to get out in the cold. I started a new blog about fly-fishing in Virginia. The site is http://thomasjeffersontrout.blogspot.com/. Look forward to visiting Western Rivers when I get back in Utah. Winters grip is waning. Soon to give way to warmer weather. I have visions of water littered with various deflated balloons, foam and tuft. If this is what the “new” flyfisher is all about get me out of this sport. These products were designed to advance the fisher to the art of tight lining. To take a fish without a bobber is truly “Zen” The advancement of skill without a magic pill is sport. And don’t forget to put away your cell phone and look around a bit.